For other uses, see Tums (disambiguation). Tums is an antacid made of sucrose (sugar) and calcium carbonate (CaCO3) manufactured by GlaxoSmithKline in St. Louis, Missouri, USA. They are also available sugar free. It is an over-the-counter drug and available at many retail stores, including drug stores, grocery stores and mass merchandisers. It provides relief from acid indigestion, heartburn, and indigestion ("sour stomach") and is considered a calcium supplement. In 1928, Jim Howe, a pharmacist in St. Louis, Missouri, developed Tums in the basement of his home while treating his wife's indigestion. The remedy caught on, and commercial production began in 1930 by the Lewis-Howe Company, which took its name from Howe and his uncle, A. H. Lewis, who was a pharmacist in Bolivar, Missouri; Howe worked in his uncle's drugstore as a teenager. In 1978 the company was purchased by Revlon of New York, making it no longer a St. Louis-based company. Revlon's Norcliff Thayer unit oversaw the Tums brand. Revlon spun Norcliff Thayer off to Beecham Group in 1986, and Beecham eventually became GlaxoSmithKline through a series of mergers. Since 1930, a plant originally built by Lewis-Howe in downtown St. Louis has been making the antacid tablets. The factory complex is the main manufacturing site for Tums to this day, and GlaxoSmithKline recently completed millions of dollars worth of renovations and modernizations. Famous advertising campaigns for Tums have included "Tums for the Tummy" and, much later for television, "Mother Tums" ("There, there!") and by a memorable barbershop jingle sung to the theme music used in all versions of the TV crime drama series Dragnet. 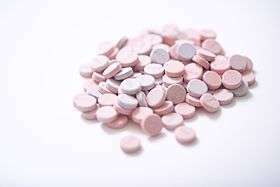 Tums comes in chewable tablets that are taken orally. It is also available in different flavors such as peppermint and fruits such as berries, orange, and cherry. ↑ Brown, Lisa (September 5, 2010). "Tums still rolling after 80 years". www.stltoday.com. Retrieved 9 November 2013. ↑ Latzke, Jeff (January 1, 2004). "Tums give 75 years of relief". www.enquirer.com. The Cincinnati Enquirer via Associated Press. Retrieved 9 November 2013. ↑ Brunsdale, Mitzi. Icons of Mystery and Crime Detection. ABC-CLIO. p. 250. Retrieved 2014-07-10.